IMN is excited to announce a new partnership with Prohibition Partners, Europe’s leading provider of market and strategic insights into the European legal cannabis markets. 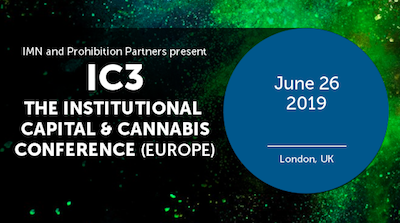 IMN and Prohibition Partners will co-host the first annual Institutional Capital & Cannabis Conference Europe (IC3 Europe), June 26, in London. With over double the population of the US and Canada combined, Europe is expected to become the largest legal cannabis market in the world, within the next five to ten years. Some analysts are estimating that the European legal cannabis market will be worth €125 billion by 2028. The multijurisdictional nature of Europe makes it a complex market but lessons can be learned from regulated markets as industry players look to take advantage of the opportunities that exist. IMN’s IC3 forums are a meeting place for investors who wish to invest or learn more about this exciting and high-growth new asset class, cannabis companies and investment funds who are looking to raise money or showcase their products, and professional service providers who facilitate these groups doing business. Our US conferences have earned a reputation for quality content, expert speakers, and a high representation of institutional investors. Previous IC3 participants include leading cannabis brands Canndescent, MedMen, MedReleaf, Flow Kana, Tikun Olam and funds such as Privateer Holdings (Tilray, Marley Natural), Casa Verde (Eaze), Gotham Green Partners (Cronos), Merida Capital (KushCo) and a number of ex-Wall Street professionals turned private investors. IMN is excited to bring this one-of-kind forum aimed at sophisticated investors seeking alternative asset classes and portfolio diversification to the UK this June.